When on my way back from the Dadaloba festival in the summer of 2008, I came across an English family on their way around Tusheti on horseback. I had been in touch with dad - Chris Wills - by email many months beforehand, and both parties were much surprised to bump into each other in Patima's wonderful guesthouse in the small hamlet of Djvarboseli! Here is a link to their blog, a fine tale of horsemanship and feasting, and probably the best account of a wonderful stay in Tusheti! And for more information on how to get to Tusheti in the first place, please see this entry on my blog. 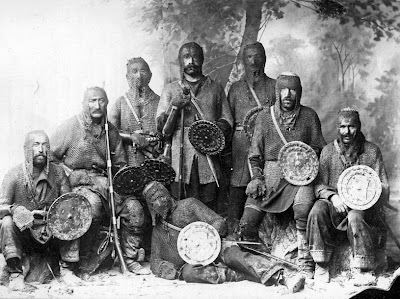 I do not wish to become embroiled in the common nonsensical discussions about the Khevsurs being the descendants of Crusaders who somehow got lost in the Caucasus on their way from Europe to the Holy Land. Even a basic knowledge of geography suffices to know that Khevsureti is a long, long way from the routes followed by the Crusaders from Europe! Regardless: This old studio photograph (probably taken in Tbilisi) is so wonderful that I feel I must post it! Here is a Youtube video showing old films and photographs of parik'aoba or tch'a-tch'riloba. 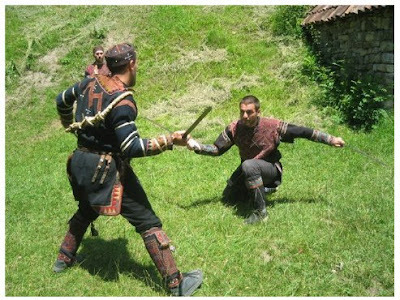 The first few seconds (filmed in the late 1920s) are a good example of this practice, as the two fighters are not wearing chain mail hoods (which were included in all the early photographs of the Khevsurs, which prized dramatic effect over ethnographic accuracy). i.e. "Tusheti's Jennifer Lopez" - some indication of her fame and popularity! She was born in Dano, a small, nearly abandoned hamlet in Pirikiti Tusheti. Like most Tush families, hers had no doubt been spending the harsh winters down in the valley of the Alazani, in Kvemo Alvani (where her house - and indeed her mother! - are still to be seen). Her haunting songs are THE music played by all the Tush, irrespective of origin (Tchaghma, Pirikiti, Gometsri, Tsova, Tbilisi Tush, etc. ), and some of them - particularly "How beautiful is Tusheti!" - have come to represent the very soul of Tusheti - indeed, to the detriment of other Tush artists: Ask any Georgian (or Tush) to name a singer from Tusheti, and every single one will come up with Lela Tataraidze. 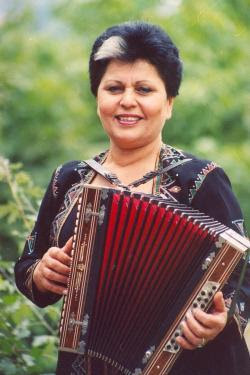 But ask them to name a singer from Tusheti other than Lela Tataraidze, however, and you will most likely draw a blank. "ra lamazia tusheti", or "How beautiful is Tusheti", and a lamentation for the death of several [Tush] people carried away in an avalanche (in the 1970s or -80s, I believe). For more traditional Georgian songs - not from Tusheti, however - please see my previous post on two songs by Sandro Kavsadze. Notice the peak in August? Those are all the journos frantically searching the web for information on Georgia and South Ossetia!